Had a couple of different jobs today. Firstly machining up a couple of bushes to allow a 70's girder to fit an XS650. 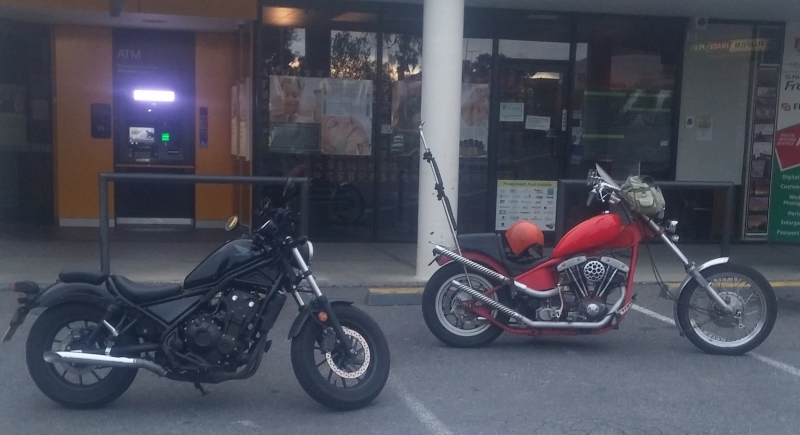 Wayne picked up a nice girder for his XS 650 some months ago. The problem is that the head stem does not match the XS bearings. First step is to do some measuring. Firstly... is the head stem of the girder long enough to fit the XS once bearings and top tree are installed. 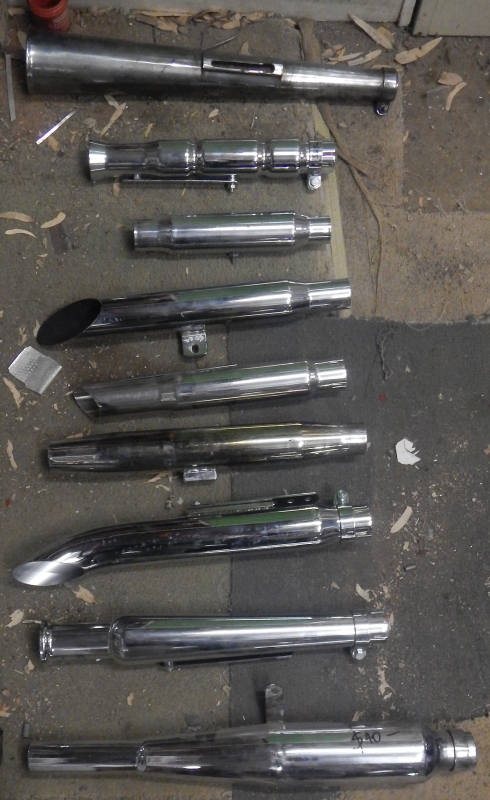 After measuring, it could be 10mm longer, but will just make it. The top nut will only have 10mm of thread, but we can counter bore the top tree which is an inch thick about 8mm. 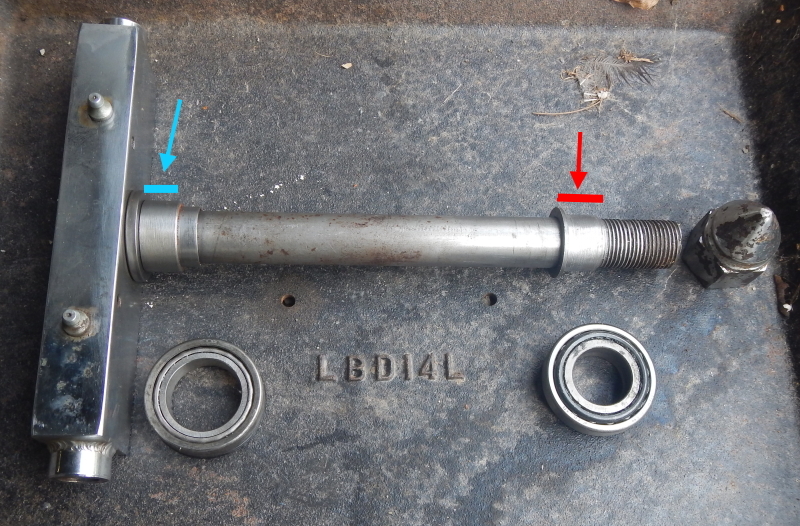 Currently it has no lock nut, so this way, we will be able to fit a 4mm lock nut and leave 14mm of thread for the top nut which will be sufficient to hold the front end together. Next step is to ascertain where the bearings will sit once together. Measurements of an existing steering head establishes the top bearing will take up a space between 170 and 190mm above the bottom tree which is up to the edge of the existing thread. 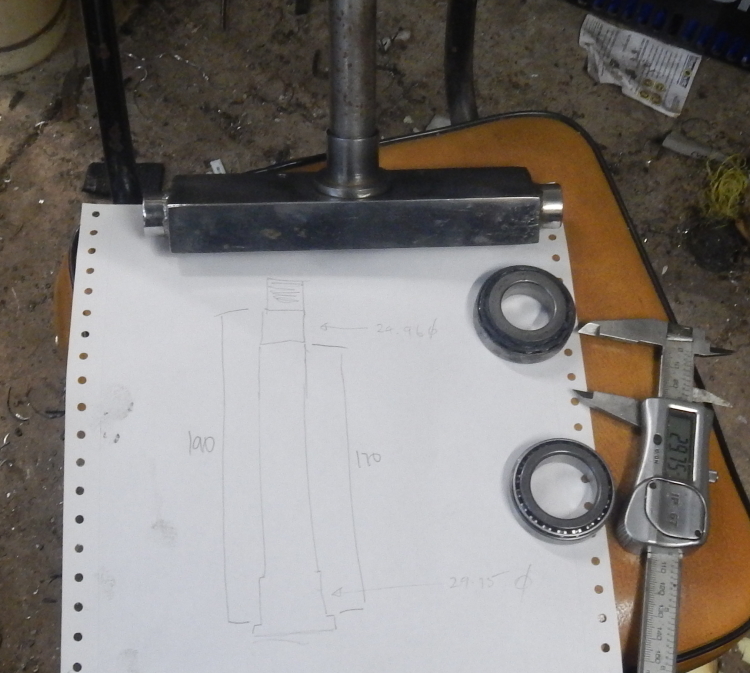 I forgot to take a photo of the joining piece, but it was able to be done with one mandrel bend cut part way through the bend and welded to a 4" piece of straight pipe. 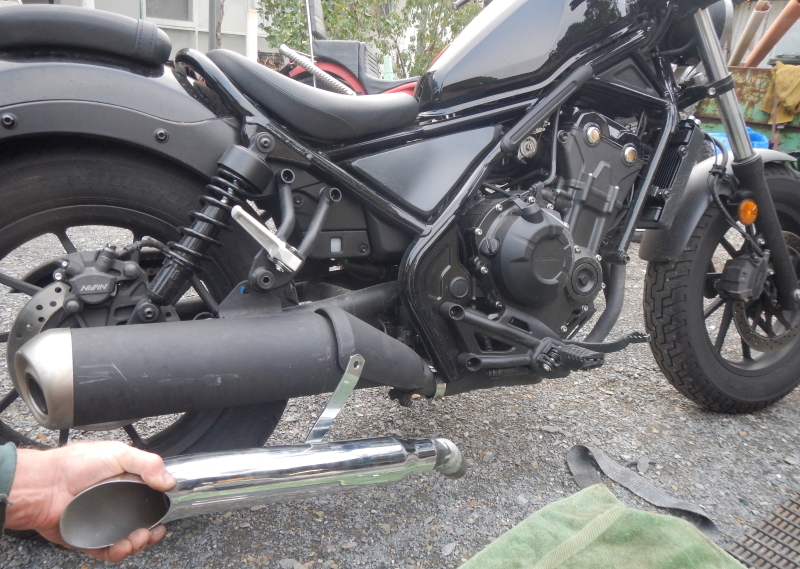 Both ends of the 13/4" pipe needed to be expanded to fit the muffler and the tail pipe. Once done, Simon wrapped the joiner with some fibre wrap and fastened them with a pair of stainless ties. I told him to take it for a quick spin up the road, first to check out the sound and secondly to check whether the performance was affected. 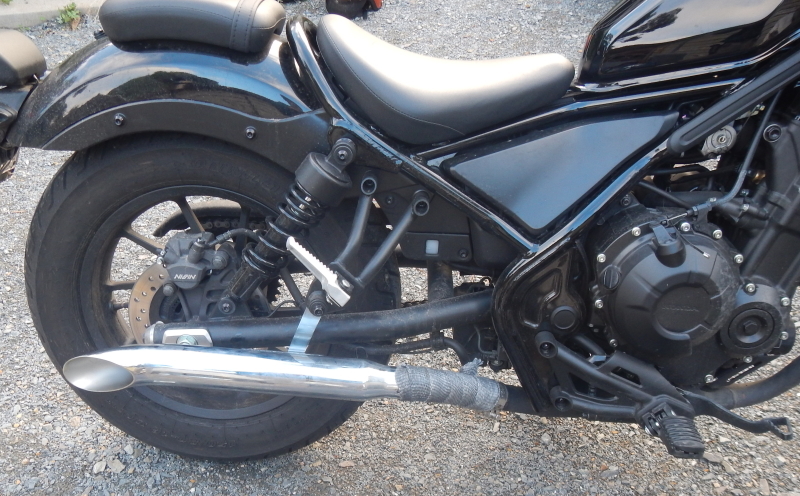 Being fuel injection swapping a heavily baffled pipe for a less baffled aftermarket muffler can cause problems, but Simon reckons he felt it was a bit quicker and the motor felt freer... came back with a big grin! I suggested we go out for a short spin to which Simon readily agreed. Got my gear together and fired up the shovel and two pleasantly noisy machines headed out of the driveway. First stop, the ATM so the poor old Prof could get paid! Simon took up my suggestion to head for the beach. The sun was getting close to setting as we moved out of McLaren Vale with great gusto. I led Simon along some back roads including some dirt to Silver Sands. Most local CA members will know the ones I am talking about! 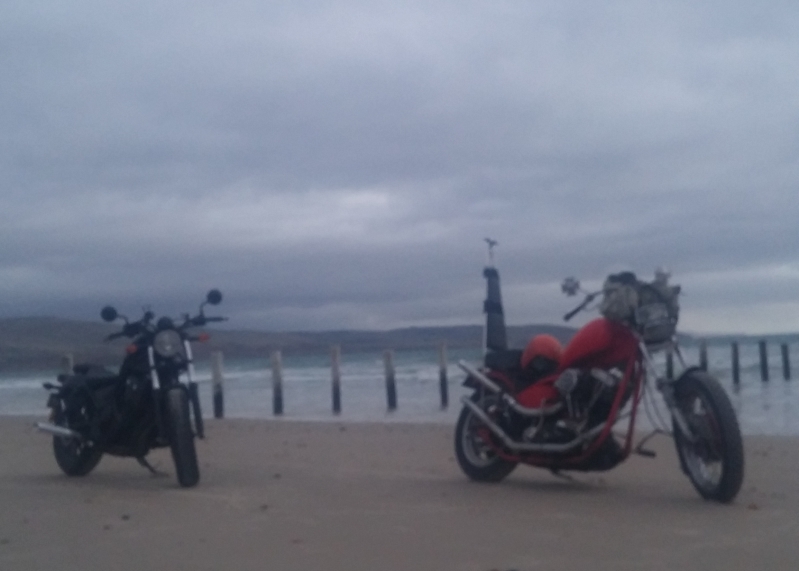 Simon was game to try the beach for the first time and we quietly headed for the Aldinga ramp.. Finally a cruise along the Esplanade to Pt Willunga, grabbing a drink at a cafe along the way and sitting admiring our machines.